NEWPORT BEACH — Clocking in at an office flanked by a beach, yacht club, harbor and multimillion-dollar residences would seem like quite the place to work. For David Ginther and John Whitman, working at the Newport Beach Harbor Patrol, which is located on Bayside Drive in Corona Del Mar, was more than just a job or a glamorous destination. Serving the public and interacting with boaters and mariners on a daily basis was what Ginther and Whitman signed up for when they joined the Orange County Sheriff’s Department almost 30 years ago. Looking back upon their respective careers, Ginther and Whitman both say they could not have asked for a better situation. 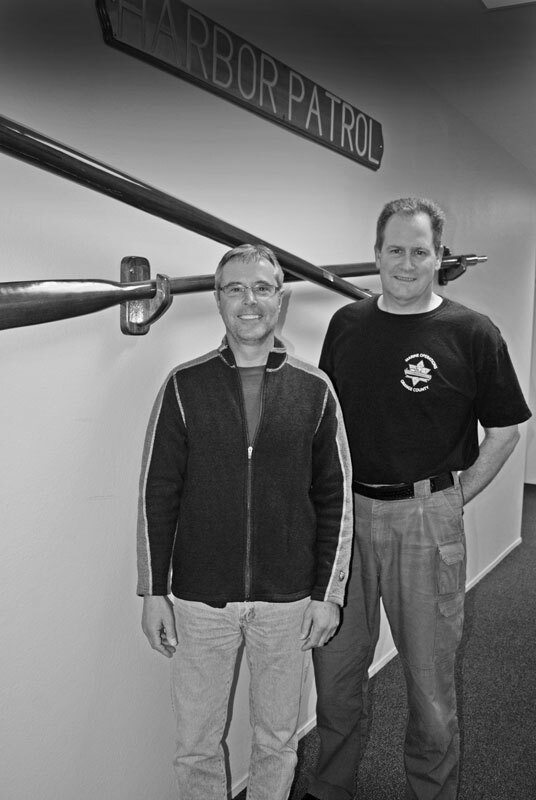 After spending some time working the jails and floating around within the system, Ginther and Whitman spent a better part of their respective careers as sergeants at Harbor Patrol. Each retiring from their respective posts in late 2014, Ginther and Whitman, who spent time together at the academy in 1987, shared some perspectives on their work some of the biggest topics affecting Newport Harbor today. THE LOG: Is it different being a deputy or sergeant on water instead of on land? JOHN WHITMAN: It’s very PR-oriented [serving on Harbor Patrol]. The first thing is we’re here to help people. One of the best things about here is most of the contacts we have are positive contacts. We’re not there to take in a juvenile; we’re not there because they had the worst day of their life. Instead, maybe their boat broke down or it might be sinking, but it’s going to have a positive outcome in most cases. You kind of have two different deals working the harbor. This time of year, in the winter time, it’s all about storms and there’s not many recreational issues going on. It’s more about storms and keeping boats safe. When summer rolls around, it’s the busy time of year. You’re going to get more boats on the water. At that point, you’re dealing with enforcement and rescues just because of the sheer volume of people out here. When I got down here as a deputy, it was a little bit of an eye-opener to see that it’s a lot busier than what people might think. It’s just not being on a boat and waving. We actually do quite a bit of work. There is quite a bit of enforcement action. TL: What were some of the toughest arrests or citations you had to make or issue? JW: I had one when I first came back as a sergeant. We had a boat that was on the night shift. The deputies working late with me saw this boat with no navigation lights on. We attempted to make a stop on the boat and he fled from us – headed out to what we call Area 1, which is the ocean – and blacked out his lights. I was actually at Sunset Harbor. When I got back to the office, the dispatcher told me the gentleman’s mother had called the Coast Guard to see if we were following her son. When we got him on the phone, he said he had a bunch of weapons on board his boat and he wouldn’t be taken alive if we tried to apprehend him. As it turned, out after trying to get SWAT on board and storming onto the vessel, the guy had no weapons. He was just drunk and passed out, had a lot of mental issues. DAVID GINTHER: We received an emergency call of a body floating in the water out by Newport Harbor Yacht Club. [Later], we got reports, unfortunately, that a swan had been struck. For some reason, I knew that was going to become a public relations nightmare for us. So I called our supervisor, the lieutenant, and she contacted public relations. We began to address some of the community issues. It went on for quite a while, but we finally somewhat regained our status. There was some conflict and some … distrust in us for a while. It was kind of an awkward situation. Beyond that, the memorable issues for me, unfortunately, were the multiple deaths that I saw over all the years … between people getting murdered or washing off the jetties, and … being hit with props of vessels. That takes a toll on you after a while. I had to notify a bunch of people of the death of their relatives. TL: On a lighter note, what about sea lions? How have sea lions been an issue in Newport Harbor and how has that affected your work? JW: Probably the biggest complaints we get are the noise complaints from the residents. The sea lions really like the boats out on the moorings. Part of the requirements of a mooring owner is to try to sea-lion-proof their boats. We routinely go to those areas and try to shoo them off. TL: In the summertime, with the high-traffic areas filled with boaters and users of kayaks and standup paddle boards, what are some of the risks and safety concerns involved? DG: During the summer, we have to be very cautious in our maneuvering through the harbor, especially when we use lights and sirens. We obviously have to try to get to our location as quick as possible, but it’s very awkward and difficult. JW: When I first came to the harbor in 1997 as a deputy, and even in 2000 as a sergeant, stand up paddle boards didn’t exist. The traffic you had dealt with boaters. On busy holidays and summer weekends you might have the little sailing races and regattas. Now, you still have all that, but you also have the standup paddleboards. TL: Are there any deficiencies you see on the user end, in terms of not taking necessary safety precautions while on the water? JW: The biggest thing is to know the rules of the road. Take time, if you are going to be on the water, to learn the rules of the road so you don’t have dangerous crossing situations, you don’t have people trying to overtake another boat. Simply knowing the rules of the road and also making sure people bring all the proper safety equipment out, that’s going to be the biggest thing. Just be aware of what’s going on around the boat. TL: What about jetpacks? Do you think they should be allowed in the harbor? JW: They are something new in the harbor. They are a legal vessel, but I think there has to be some control. There have been some issues with city, probably due to some noise violations and residents complaining about the noise they are creating. TL: Are abandoned vessels a major nuisance? DG: They are a nuisance for everyone, not just us. Once a vessel is abandoned, then there is a process that’s implemented to dispose of it, but that can be somewhat lengthy. In the meantime, you have issues of us protecting the property, you have situations where they take on water, sink, pollution, all those environmental issues, sea lions and such. All of that can be combined. TL: How much of an issue is speeding and drunk boating in Newport Harbor? DG: I’d say there’s really no difference between water and land. I’d say about 95 percent … of people obey the speed limit. When they don’t, it’s pretty obvious. We often [deal with it] with a warning; a lot of times, people are not familiar [with the laws]. I’ve stopped people that are full speed on a vessel or a jet ski and they’re clueless. That’s an educational moment. If we feel, of course, that they did know [the laws], then a citation might be warranted. With drinking, boating under the influence, I’d say it’s similar to on land. JW: Obviously the biggest difference is that it’s perfectly legal to drink and operate a boat, so people definitely need to know what their limitations are. It’s extremely important to have a designated operator that’s not going to be drinking. Occupants aboard the boat can obviously partake but the operator needs to make sure that he tries to not drink at all. TL: A few months ago, Gov. Jerry Brown signed a new law requiring boat operators to complete a boater safety course. What are your thoughts on the new law? Will it be effective? DG: I think it’s a good idea to have a basic knowledge of the rules of the road and the … operation of a vessel. Right now, anyone can operate a boat. With rental businesses, you basically just show up, pay a fee and you’re in a vessel with no education whatsoever or evaluation of your skills. If it does come to fruition, it will be a positive change. JW: At least from what I’ve heard of it so far, it doesn’t sound like the process is too cumbersome. More knowledge is power. TL: Based upon your experiences so far with the Harbor Patrol, what is something you would like to see changed? Were there any deficiencies during your respective tenures that should be addressed to benefit current and future Harbor Patrol members? JW: We’re pretty favorable about this environment. DG: I don’t think I want to go there but there have always been issues about Harbor Patrol funding and its purpose. That’s beyond the scope of this [chat]. It would be nice to finally have that settled. It was kind of settled at the last performance evaluation. JW: My goal, when I was hired on, was to eventually get to Harbor Patrol. The fact I was able to spend just a little bit more than half of my career with the Harbor Patrol, honestly I can’t see there being a do-over. DG: We’ve been blessed, if you will, with serving the public all those years.